Press Enter or click the Search button above to view results. Case: Age 64, Acute Liver Failure? A 64-year-old man with a history of chronic obstructive pulmonary disease, alcohol abuse, and depression presents with acute hepatic failure. Can you identify the correct cause? Trichotillomania Owing to its moderate demonstrated efficacy and favorable adverse effect profile, current recommendations suggest N-acetylcysteine (NAC) should be considered in all cases of trichotillomania. Rheumatoid Arthritis: In and Out of the Joint Arthritis exists in multiple forms, including rheumatoid arthritis (RA) and osteoarthritis. Do you know the distinguishing features of RA, and are you familiar with the disease's potential extra-articular manifestations? Bacterial Skin Infections: Can You Make the Diagnosis? Bacterial skin infections are very common, with presentations ranging from subtle to alarming. Can you correctly identify these lesions? Test your diagnostic acumen with our slideshow. Don't Bump the Bump: Trauma in Pregnancy Trauma is the leading nonobstetric cause of maternal death--and it occurs in an estimated 1 in 12 pregnancies. Learn about predisposing risk factors for, and causes and patterns of, injury in pregnant women, as well as how pregnancy changes affect their management after trauma. Recognizing Renal Cell Carcinoma Although many kidney masses are benign, with renal cell carcinoma (RCC) accounting for approximately just 3.8% of all US cancer diagnoses made annually, the possibility of RCC must not be overlooked. Learn more about evaluating these lesions. More than 7100 monographs are provided for prescription and over-the-counter drugs, as well as for corresponding brand-name drugs, herbals, and supplements. 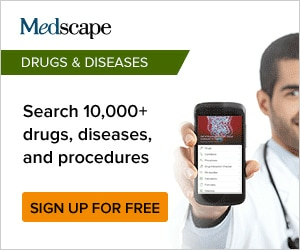 Drug information included within Medscape Drugs & Diseases is based on FDA approvals. Drug images are also included.